NOTES: Zarana has plastic that can change in color like her brothers Zandar and Zartan. Her torso is glued together and this makes it very difficult to fix broken O-rings. 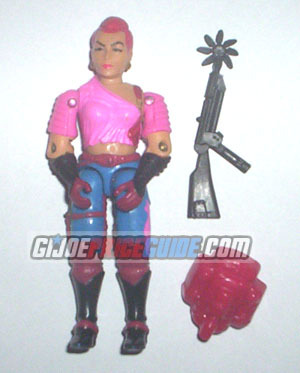 This picture is an example of the early Zarana figures that had a different, larger looking head and earrings. This version of Zarana is harder to find.